The team arrived behind the Heacham seawall at 06:00. Meg joined Nigel and Lucy in the hide, Cathy and Ron volunteered to long stop with Kathryn and Rob twinkling. Tim briefed those remaining at base camp before they all returned to their cars for the wait. One car from Lincolnshire (five people) arrived to join the team. Two nets were fired at 07:42 and the team successfully extracted a reasonable catch. Processing was conducted under a make-shift cover after it started to rain and was completed by 10:32. The team left Snettisham at 10:55 and were back at base by 11:30. After breakfast, the Lincs team departed with four Terrington team members (Chris, Bob, Kathryn and Meg) to help with the evening attempt on Wainfleet. The Norfolk crew had some down time and did some chores, before having an early dinner and heading out to set two small mesh nets for the Sanderling flock on Heacham South beach. The nets were set very efficiently in about half an hour and everyone was in position by 18:35. Jacquie and Phil were on the beach at the Snettisham end with Patricia as long stop, while Cathy and Lucy were on the beach Heacham end. Nigel was on the firing box at base camp, an unusual occurrence! There was a flock on the beach just beyond net two, and further towards Heacham. Lucy sent Cathy to twinkle. Jacquie warned we may need to be ready at short notice. A few minutes later, we heard Jacquie’s 3 2 1 fire, but it was quickly apparent that something was wrong because there was no boom. Nigel yells at the radio “which net? !” – twice! while Jacquie was also transmitting far net, far net – before they finally managed to communicate that he should fire net two (the Heacham end net) and we then headed to the beach. The net was fired into water, and the lift was flawless, with birds out of the water, covered and extracted quickly. A delighted, but slightly embarrassed Jacquie commented that Nigel’s powers of telepathy were clearly rusty – obviously it was the far net! Holbeach: two stubble fields, 200 Curlew on each, one an easy field to catch on, but one flock probably disturbed from landing by farm machinery, half hour before tide. Field to East of Nene: 200 Curlew in outer pea field, already there when David arrived at 08:00, quite close to outer sea wall. Admiral’s: 400 Curlew on ploughed field just to west of white barn, 250 Golden Plover, marsh covered. Royal Estate: 2−3,000 godwit landing on grass and clover field cut once or twice this year, close to the field where a good Bar-tailed Godwit catch was made in 2017; a very tight flock all within one clap net pair set, 500+ Curlew more dispersed on field with godwit. Ken Hill: 200+ Curlew flushed from field near the camping place, 60 Curlew returned and seemed settled, the rest flew off towards the Royal Estate. A team went off in the afternoon to set on the Royal Estate, with the aim to catch godwit on Tuesday morning, with all the Lincs team coming round to run another set of nets. Any passers-by would have been treated to the strange sight of a “cult” ritual of ranks of ringers marching in lines stamping grass down with their feet. Two clap net pairs were set on the field where the big flock of godwit were roosting (to be run by the Norfolk team) and a single clap net pair in a nearby stubble field, with the catching area strimmed, where a smaller flock of Curlew roosted (to be run by the Lincs team). Both teams squeezed into the base house and a team talk to all 32 people in preparation for the Tuesday morning catch was given by Lucy, with Nigel politely pushing her out of the way into the kitchen at the start of it. With both teams spending the night in Norfolk, a plan for staggered getting up times/breakfast/leaving was devised. The hide teams left at 05:15 and consisted of: Norfolk – Nigel, Sam and Kathryn in hide 1, Jacquie Lucy and Chris in hide 2. Lincs – Steve, Ryan and Ellie in hide 1 and Emily and Lizzie in hide 2. Hides 1 and 2 (Lincs) were on the clap-net pair in the stubble field with hides 3 and 4 on the double clap-net pair (Norfolk). The team for Basecamp 1 left at 05:45 and consisted of the remaining Lincs team members plus Tim who knows the area well. The team for Basecamp 2 left at 06:15 and consisted of the remaining Norfolk team members. With everyone in position, the watching and waiting began. A few Curlew landed in the cut-grass field (Norfolk nets), but were well out of the catching area. At the Lincs nets the first few Curlew did a wide loop and then came straight into the catching area. Birds then steadily built up to 80 or so Curlew in the catching area, mainly in Emily’s nets – hide 2. Then Bar-tailed Godwit started to join, mainly in Emily’s net, with some in Steve’s. Unfortunately, a quad bike came by that spooked most of the birds, they looped and landed again but several birds were now in Emily’s safety. More Curlew then moved into safety, but more Godwit came into Steve’s net. Emily’s net quickly became not an option, but the Godwit flock keep building and spreading into Steve’s catching area. Once there was a break in the Godwit flock, Steve took the catch on his net and we all got to the net fast. Once the net was fired and the catch assessed, all teams were given the go-ahead to get to the field – those in the ‘Norfolk’ hides and base camp had had to sit still waiting to hear if they were needed, or should continue to man their nets. A very difficult wait as, when a net fires, we are so conditioned to run. With a brilliant catch everyone headed over and extraction began and, with such a large and well-organised team, the birds were quickly and quietly, extracted and put in keeping cages for processing. Following the catch, everyone returned to Norfolk for a 15:00 breakfast and debrief. After breakfast the Lincs team left to set for their next catch the following day while some of the Norfolk team went to set on Ken Hill and others stayed back to check the large amounts of data. Two full nets were efficiently set on Ken Hill, aiming inland on a grassy slope, but as the field was in use by cows, no droppers were be set until the following day. Twinkling was probably not an option and the catch was not expected to be big. Following dinner, and a briefing from Nigel, the trailer was readied for the morning and most people retired to bed by 22:00. A late start (05:45) saw the team refreshed and fit so final setting was done quickly and efficiently and was finished at least 15 minutes before the scheduled time, despite everyone arriving a bit later than expected due to traffic. Two hides were in use, one with Nigel with a view of the catching site, the other a ‘blind’ hide, with Lucy, Gary, Dave and Tim in it, to allow them to be close to the net so they could get there quickly after firing. The rest of the team returned to their cars (apart from Kathryn and David who went to check out the fields towards the beach) and the waiting began again. Nigel reported Lapwing flying low over which may have landed if Lapwing decoys had been put out, but nothing else seemed to be interested so Chris and Bob were sent to some other nearby fields to see if the Curlew were there. After reporting back there were no Curlew in any fields nearby, they were sent to the Royal Estate to check out the previous day’s fields to see if they could find some there. Almost as soon as Chris and Bob set off for the Royal estate, a few Curlew landed in the catching area and they were called back. Kathryn and David reported flocks of Curlew coming from the north and about 60 landed, with 50 in catching area but one in safety, which wandered out after a couple of minutes, so a single net was fired. The corner of the net was caught by wind so a few birds managed to get away, but 32 were caught. They were efficiently and quietly extracted and then successfully processed, including colour rings and flags. After breakfast, which included Nigel’s eggy bread, the team were briefed for an evening mist-net session on Terrington Marsh, as well as the possibility of a Thursday morning cannon netting catch, but the forecast wasn’t great, so a final decision on the possible cannon-net catch would be made after the mist-netting session. The Lincs team returned to the Norfolk side so we could have three teams working the white barn pool, the E pool and the cannon net pool. Most of the Lincs team went to the cannon net pool, with the Norfolk team splitting into two to cover the E and white barn pools. Following on from another quick and efficient set up, Ron and Peter stayed to watch the nets while everyone else returned to base for curry. Nigel gave the team talk including ‘if we’re lucky we might get 100 birds’ and the whole team left for the marsh at 20:15. Just over five and a half hours later, the last car left the white barn following an amazing catch of nine species totalling 231 new birds and two retraps. The highlight of the evening was the first Terek Sandpiper to be ringed in Britain & Ireland! (see http://wwrg.org.uk/an-excellent-catch-with-a-bonus-bird). Some members (possibly the more sensible ones) retired to bed immediately on arrival back at base, but a reasonably large number stayed up for a quick celebratory drink to mark the first Terek Sandpiper ringing (by Emily) and processing (by Lucy) and a cheer went up when it was discovered that 505 was the previous biggest ever WWRG Bar-tailed Godwit catch, in August 1976, so a WWRG record and a Britain and Ireland record had been achieved in the last two days. A decision was made around 02:30 on Thursday morning that Nigel and Steve would get up at 06:30 and make a decision on cannon netting for Sanderling once they saw the weather. They did this and took less than five mins to decide no, so most of the team got a good lie in. The planned sanderling catch on Thursday morning was called off due to continuous rain, having a late night the previous night and having caught well in the week including a good Sanderling sample. Once the rain stopped, and all equipment was sorted, the full team had breakfast before splitting up again to do more mist netting sessions on Terrington Marsh and in Lincs. As the team dwindled, with some heading off to the Bird Fair etc. and the Lincs team heading for Bowsers, the Norfolk team decided to catch on the nearby marsh, but only on two pools. A team went down to set and put five nets in a U shape on the white barn pool, with an extra net on a small pool and six nets on the E pool. It was another lovely evening for mist netting, with a nice mixed catch of just under 100 birds and, surprisingly, three Whimbrel. With the tide at 23:10 (when we take the nets down) we began the bulk of processing at midnight and had them all away by 01:20. A tired but happy team retired back to base and enjoyed a few drinks and chatting. The Lincs team then arrived back from their mist netting and joined the socialising before bed. A big thank you to all chefs, washer-uppers and everyone who made it a really great week! Most of the team arrived early afternoon and we all headed out to recce on various parts of the marsh. Old lookout point and main control tower at Friskney (Lucy and Graham) – two large flocks of Curlew and several thousand Knot on the shoreline of the marsh and they all sat the tide out. Bowers (Lizzie, Ryan and Ellie) – large numbers of Curlew moving south. No birds came over the sea wall onto any catchable fields as the tide did not come up high enough. Horseshoe Lagoon (Steve and Amelia) – 600−700 Oystercatchers came onto the lagoon with 100+ Curlew on the salt marsh to the south. Wainfleet Island (Emily) – over 1,000 Oystercatchers coming in in drips and drabs. Staples (Wayne and Robbie) – 100 Curlew and 20 Black-tailed Godwit on the marsh. While one car full went to join the Norfolk team for a Sanderling catch, Steve went back to the Horseshoe Lagoon – 1,000 Oystercatchers on the lagoon and three quarters of a mile south 300−400 Bar-tailed Godwit and 300−400 Curlew; there were also 50 Grey Plover on cabbages two miles to the north. Ryan went to Bowser’s – four Curlew came into a baby cabbage field and there were Curlew out on the marsh but nothing came in. 50 Golden Plover were seen on a stubble field. Had a quick look at Staples where there were 50 Ringed Plover and 40 Golden Plover on a baby cabbage field. We all reconvened and went to set a net at the Horseshoe lagoon for Oystercatchers the following morning. The net had to be put on a make shift bridge of vegetation so it didn’t get damp overnight (if the net got wet it would not to fire properly as it would be too heavy). After a quick break and dinner, the team then went to Wainfleet Island where we were joined by a car full from the Norfolk team. The extra team members meant we were able to take out two nets; it’s quite a walk! The nets were set quickly and we all retreated under the covering material with Steve and Emily in the hide. Oystercatchers started to build up but, unfortunately, they all suddenly left. Two were left on the beach and we thought it was all over. 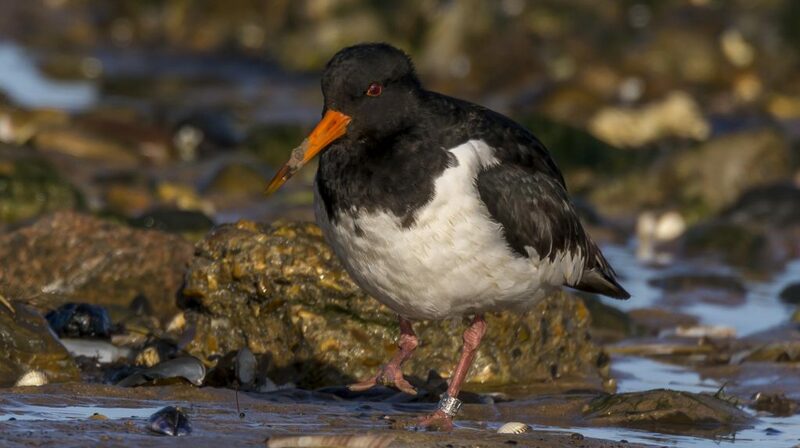 But slowly, over 45 minutes, they built back up to 1,000 Oystercatchers further south of the nets on the island. We couldn’t see anything under the covering material, but we could hear the chattering of Oystercatchers and the sound of water creeping closer. Eventually five birds made their way into the catching area, so Emily and Steve crossed their fingers and waited. The tide lifted the 1,000 birds and some joined the catchable five, as the tide rose further the birds moved up into the catching area. The birds were right in the middle of the two nets, so they decided to fire both after a five second warning. However, most of the people under covering material were not aware of what was going on as most were sound asleep until we heard the bang! The birds were lifted on to hessian quickly and extracted. The tide was predicted to be six inches lower than the morning; however it made considerably on this. To be safe, a moat was built around the kit and keeping cages and, as the tide dropped off, we started ringing and processing and were ringing into the night. After finishing we made it off the marsh with enough time to have a sleep before the morning catch. Steve was in position on the seawall well before any birds came into the lagoon. The rest of the team arrived a little later and sneaked around the seawall to get into position. As the net was on a curve it was hard to tell where it would go and what would be caught. There was one problem with work machinery coming onto the seawall and spooking quite a few birds, so, once they settled again Steve made the call to take the catch. 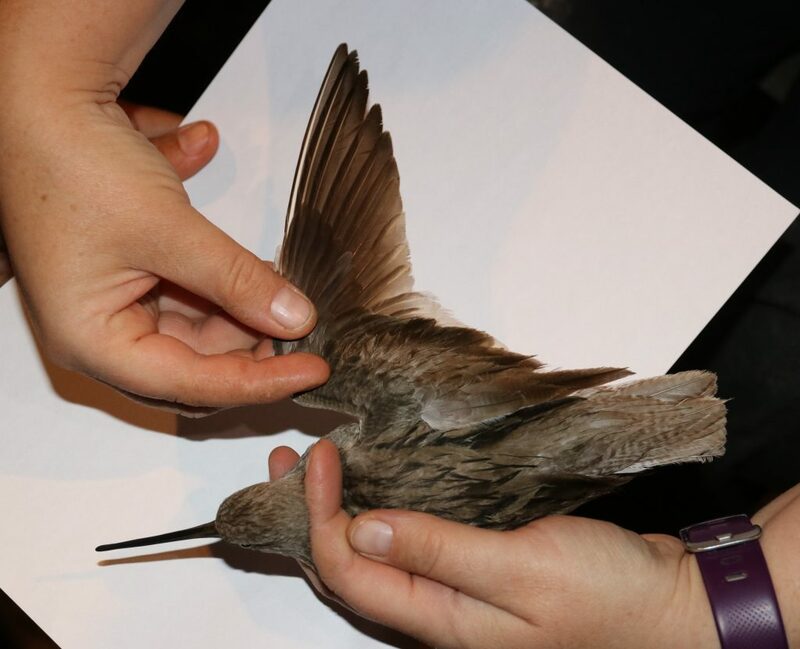 The birds were moved onto dry land to be extracted and were then moved off the spit to the other side of the lagoon for ringing and processing. There were lots of juveniles in the catch, which is expected in this location as the older birds tend to stand further out in the water. The only Lincs option for the next morning was a cultivated pea field with a 1,500 strong Curlew/Bar-tailed Godwit roost. This field was not usually caught on, so permission needed to be sorted before we could attempt there. The Norfolk team had another good Bar-tailed Godwit/Curlew option (Bar-tailed Godwit priority) for the next morning so the whole team headed over to Norfolk to help. The Noroflk team set four nets on a cut grass field (a double clap-net pair) and the Lincs team set a clap-net pair on the next field, the catching area was strimmed to make it more attractive to the godwit and Curlew (not so spikey, so easy to land in!). We all headed back to the Norfolk base house for a great meal, if a little crammed into the living room! 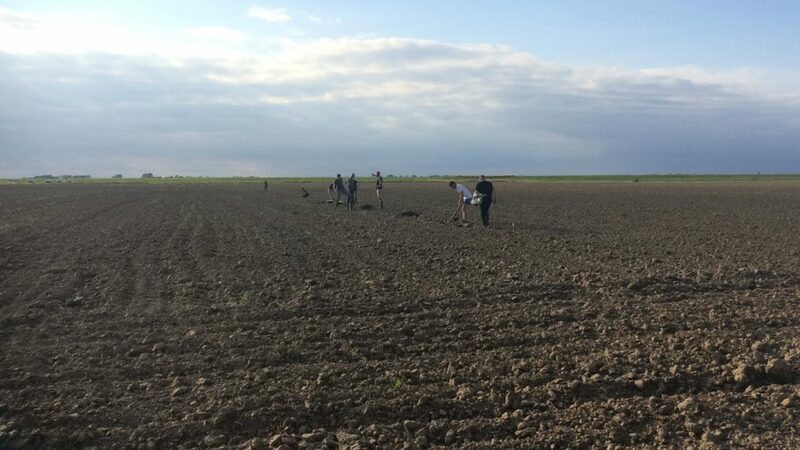 After the catch on the Norfolk side and breakfast, the Lincs team headed back to set on the pea field with the hope of catching some Curlew the next morning. We headed out in the morning to the pea field and after some commotion with the cars (turns out reversing a truck and trailer over a blind bend on a sea wall isn’t that easy) we were all in place and waited in the cars. Unfortunately, the wind had turned, and tide didn’t cover the marsh meaning the birds didn’t come into the field so we didn’t make a catch. The team decided the best option was for everyone to go mist netting at Terrington on Wednesday night. We decided to tidy and vacate the hall on Wednesday afternoon, so we all packed up and tidied, rewarded with a bowl of apple crumble before we left! The Lincs team headed over to Bowsers’ to set mist nets for the evening. It took a little while to get out to the pool as there were several large creeks, but we found a good safe way. We set an E formation on the pool of nine nets. The team retreated off the marsh leaving marker poles to make the trip back out in the dark possible. We were treated to fish and chips sat behind the sea wall and set up the processing area. Steve and Emily headed off to put out glow sticks to mark the way to and from the nets and the sound lure. Unfortunately, it took a little longer then hoping to get dark so they waited to put the sound lure on so as not to encourage birds to come in too early. Once the lure was on we started steadily catching birds. Once high tide was reached we stopped catching, the nets were taken down and everyone made it back dry to the sea wall! We all convened back at the Norfolk base for a nightcap and left-over crumble before bed! Friday morning was spent tidying and sorting data and a few last jobs before everyone headed home. A brilliant week was had, with fantastic catches, an exciting new species and great people. Big thanks to Rob and many others for putting in the effort to get such a good number of resightings this trip.